Donald Trump's executive orders are already causing chaos at the US-Mexico border, where 30,000 Haitian asylum-seekers are now trapped in legal limbo. A US federal court has blocked President Donald Trump’s January 27 executive order barring citizens from seven majority Muslim countries from entering the US, but the impacts of the travel ban are already being felt at the nation’s borders. The suspended order halts general refugee admissions for 120 days and Syrian admissions until further notice, and puts a limit of 50,000 admissions per year, down from 150,000. It also imposes major legal hurdles for those processing asylum applications. Along with the Trump administration’s proposed wall along the US-Mexico border, this situation has dealt an historic blow not just to Muslim immigrants but to the American asylum and refugee system in general – including to the more than 30,000 asylum seekers and migrants now trapped in Tijuana, Mexico, just a few miles from San Diego, California. While public attention is distracted with the travel ban’s current legal struggles and the US president’s bombastic anti-Muslim, anti-immigrant rhetoric, refugees have been building up at border crossing points between the US and Mexico, trapped in a legal limbo. I travelled to migrant shelters in early February to document this developing human rights crisis. I met the kinds of people one would expect: Mexican women escaping cartels and gender-based violence, as well as Guatemalans, Hondurans and Salvadorians fleeing Central America’s unceasing gang violence. There are also less likely suspects: Haitians who sought refuge in Brazil after the 2010 earthquake in their home country, but who have been forced to move on again due to Brazil’s profound economic and political crisis, which has dramatically reduced job availability. These Haitians aren’t necessarily the typical “economic migrant”; many are engineers, physicians, architects between 20 and 30-years-old. 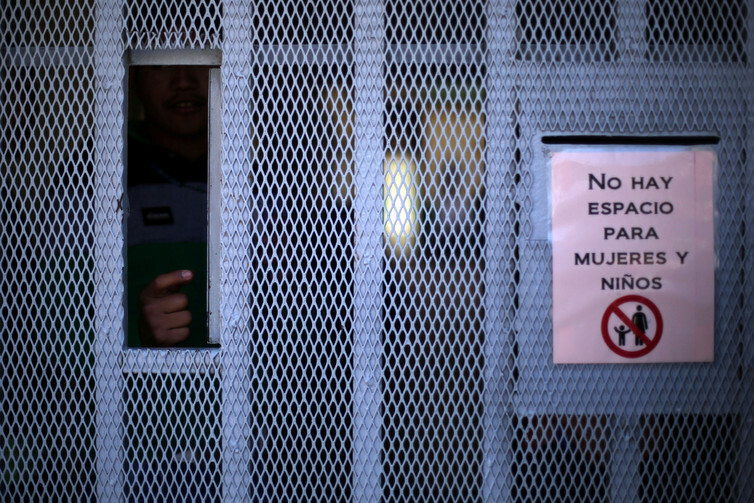 Indeed, this little-known group makes up the bulk of migrants stuck in Tijuana. 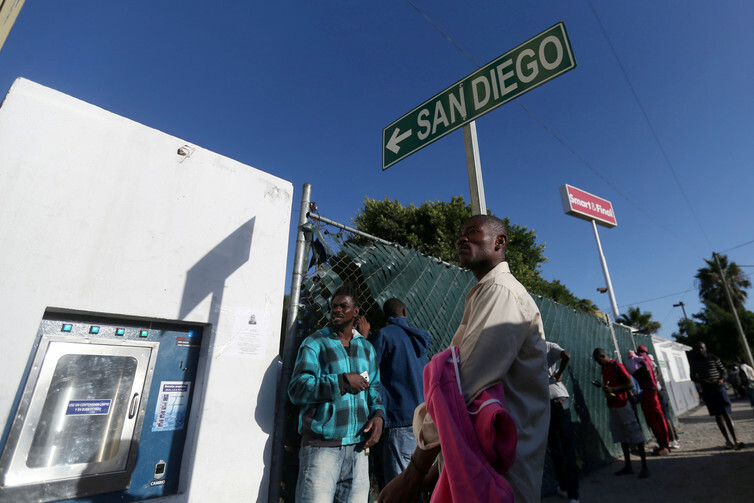 According to Tijuana migrant activist Soraya Vázquez from the Comité Estratégico de Ayuda Humanitaria Tijuana, six Haitians arrived in Tijuana on May 23, 2016. The next day there were 100. Two months later: 15,000. 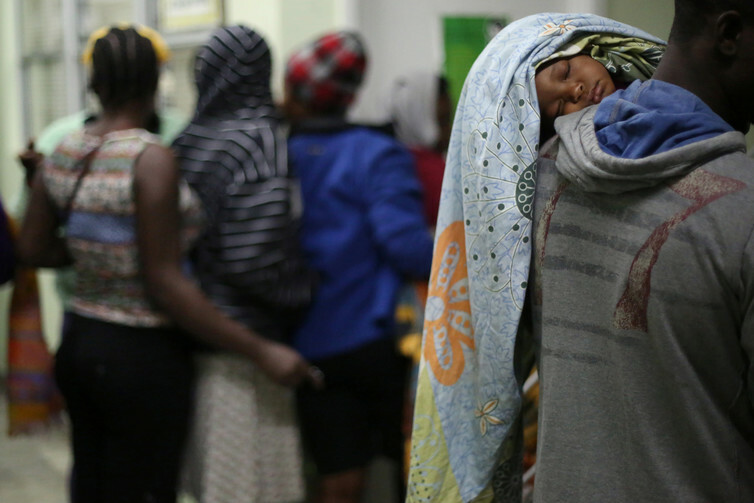 By the end of December 2016, nearly two months after Trump’s surprise election, some 30,000 Haitians had gathered there, most by way of Brazil, apparently through a trafficking network that Vázquez says is not yet documented. For comparison, 10,000 Syrians have applied for asylum in the US in the same period. Asylum seekers cannot legally work, have no permanent residence, and, if they’re Haitian, often don’t speak Spanish. Yet they must support themselves and their families while they wait for US immigration officials to figure out whether or when their asylum applications can be granted. They live in Tijuana’s open-air dumps, sewer-system holes and the surroundings of improvised migrant shelters. Many seek all manner of menial jobs on the black market, cleaning houses and offices, working in sweatshops, or delivering pizzas for as little as US$1.30 a day. Women are frequently offered generic “jobs” in Canada, no description included, along with airfare. All they have to do is give up their passports. The web pages associated with these alleged companies show a permanent error message. These are, not surprisingly, typical trafficking strategies. What has emerged in this new historical conjuncture is an intensification of the practice of disposability in which more and more individuals and groups are now considered excess, consigned to zones of abandonment, surveillance and incarceration. And so people forced to flee natural disaster and unimaginable violence in their home countries become disposable; human clutter in Mexico’s dumps and gutters, at the gateway to one of the world’s richest nations. These are what I’ve coined “disposability pockets” areas where vulnerable populations, especially migrants, are forced into inhumane living conditions and illegal labour markets, with tacit approval of the government that should, in theory and under international human rights law, be their stewards. It’s a radicalisation of what sociologists call “poverty pockets”, that is, neighbourhoods where the extremely poor tend to be corralled into ghettos, even as prosperity grows all around them. And they’re cropping up not just in Tijuana but all along Mexico’s northern border thanks to the US clampdown. By late 2016, Tijuana’s five existing migrant shelters were bursting, so many more had to be built, and quickly. Today, there are 33 overcrowded shelters adapted to house the ever-increasing numbers of Hatian arrives. I visited two: Father Chava’s Desayunador Salesiano and the Scalabrini Sisters’ women’s shelter. Father Chava’s is one of the biggest, and it used to be a soup kitchen for 1,300 to 1,500 homeless Mexican migrants. Now, it is a refuge for an equal number of asylum-seekers. They sleep in sleeping bags, small children and babies alongside their mothers, many under improvised tents erected in the garden at night. The Scalabrini shelter is smaller; it’s clean, even cosy. Built for 44, it now houses 90 women and children, and sometimes as many as 150. Overcrowded doesn’t describe it. The husbands and partners, who stay in the Scalabrini shelter for men, must wait outside to visit their wives and kids. They linger there, wandering around, filling the disposability pockets. Because there were so many Haitians at the border, the US government established that they could process only 50 interviews a day, which has delayed their interviews for up to three months. This made the situation worse for Mexicans, Hondurans, Guatemalans, and Salvadorians who were already in line. Even before Trump’s January executive order was issued, Haitians were already being deported after their interviews (Barack Obama deported more immigrants than any US president before him). Under such circumstances, many Haitian asylum seekers decided not to attend their meeting with US officials. As of today, 300 asylum applications are in limbo. After up to eight months of waiting, many of the Haitians now say they want to stay in Mexico. That won’t be easy. Not only is the US border situation forcing Mexico to handle a record number of asylum applications, but racism, poverty, crime, corruption and unemployment in the country leave migrants vulnerable to exploitation. Besides, these disposability pockets are turning out to be convenient for employers and the local political economy in general. 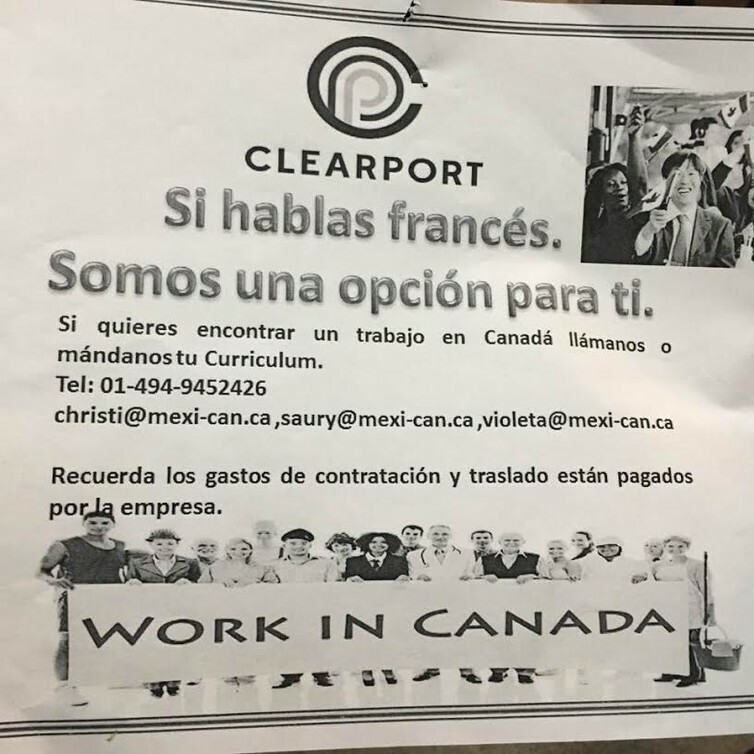 Why roll out the welcome mat for immigrants, legalise them, and pay them a living wage – in either Mexico or the US – when you’ve got a ready-made workforce willing to work for poverty wages in the border-area factories and population centres that NAFTA helped build?